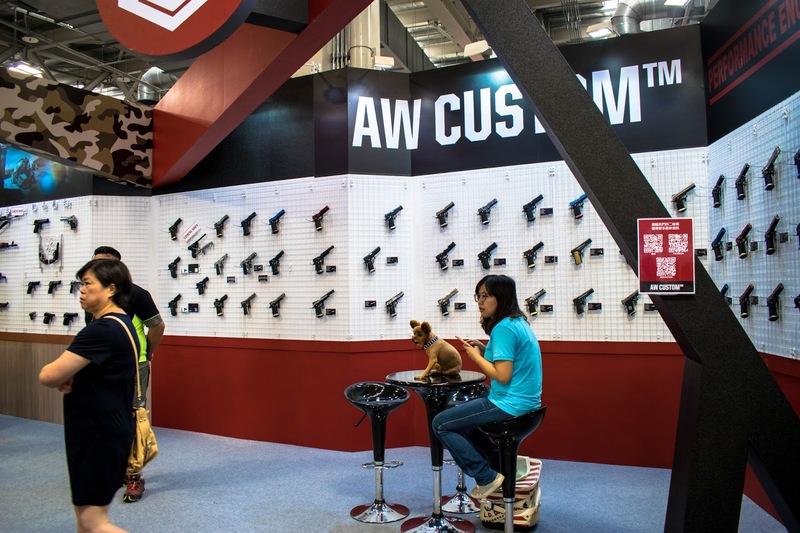 When our Editor called me and asked the question ‘Would you like to go to Taiwan to cover the G&G CQB Championships this year?’ I literally jumped for joy and squealed down the phone. The G&G World Cup CQB Shooting Competition is the World’s first Airsoft electronic target shooting competition where contestants from around the world compete in a series of stages including the G&G 5x5 MET system for the title of world champion in the gorgeous city of Taipei in Taiwan. 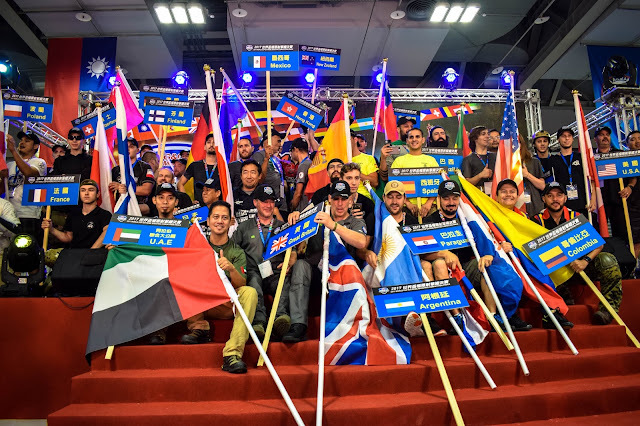 In 2015, 38 contestants from 12 countries around the globe competed in the first ever CQB shooting competition and this year the competition is bigger, better and more intense - with 60 contestants from 25 countries including Taiwan, USA, UK, France, Switzerland etc all competing for the title and the first prize of $10,000 USD! 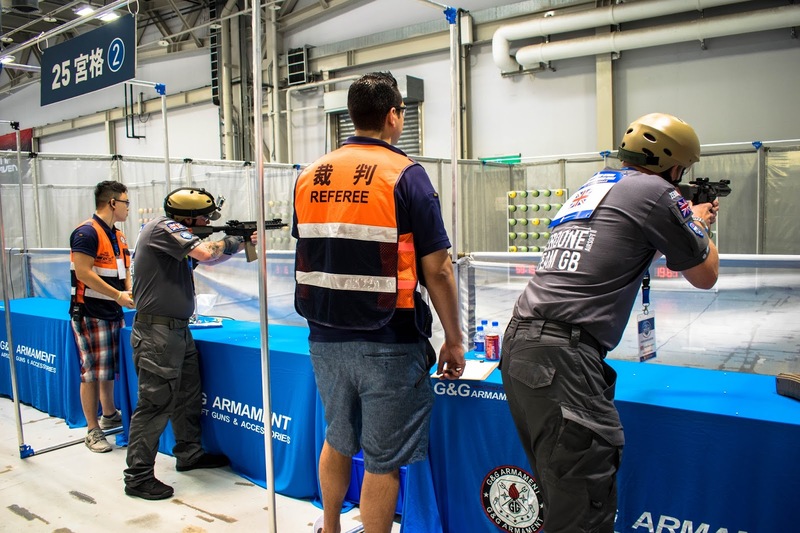 Teams are chosen from qualifying events in their respective countries and those who qualify are rewarded by G&G with paid flights/accommodation to the competition in Taiwan and the chance to compete for the title of World Champion. The M.E.T 5x5 stage is the first stage of the competition, where contestants use the G&G CM16 – SRS rifle to eliminate the 25 targets until completion – what’s the catch? The target changes every 1.5 seconds. 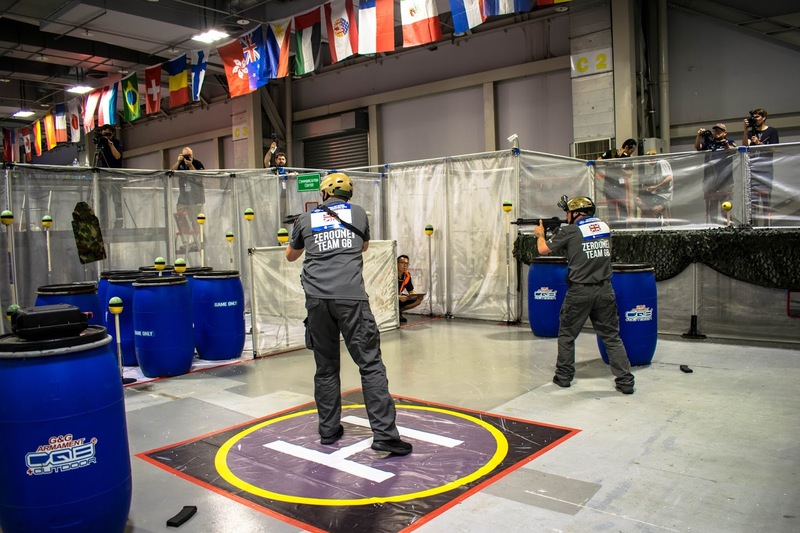 Each shooter is given a lane adjacent to their partner and must use the provided RIF to eliminate all of the targets in the quickest time possible. Search & Destroy is the third stage of the competition and is linked to the Humvee Sniper stage. Upon completion of the previous stage the competitors leave the Humvee and their previous weapons in the car, pick up their CM16 – SRS rifles and activate the M.E.T system. During Search & Destroy the targets light up and emit a sound until cleared – more than one target may light up and emit sounds at a different location at the same time. Contestants during this stage are allowed to move around the whole field but shooting can only take place in the designated shooting areas. There are DQs (disqualifiers) for each stage and each stage has it’s own particular set of rules which contestants must adhere to. Countries that have the M.E.T 5x5 system and the full CQB course set up send 2 teams to the world shooting cup, countries who just have the M.E.T 5x5 system like the UK are only permitted to send one team. So what exactly happens in the competition? Most of the contestants arrived in Taiwan from their respective countries on Thursday 8th June ready for the competition to kick off on Friday 9th. 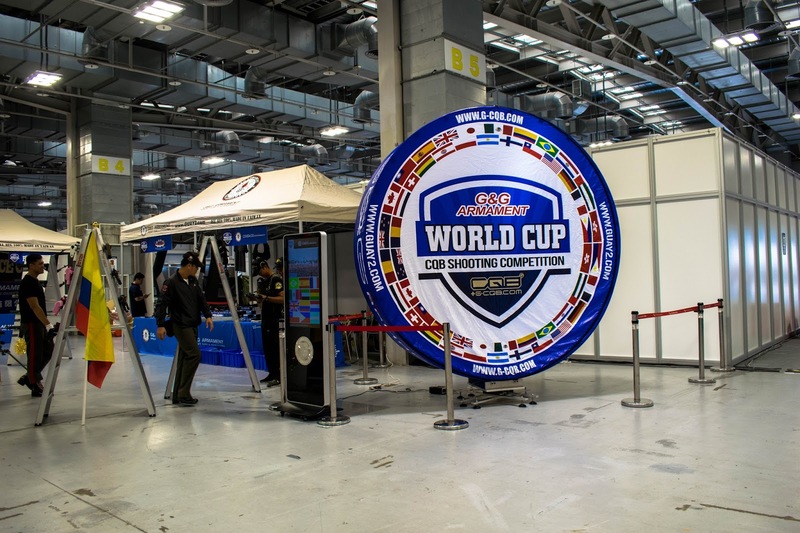 Due to the flight times from Heathrow I arrived in Taiwan on Friday 9th just 2 hours before the competition was due to commence, so it was a mad rush for me to get from the Airport to the Hotel the contestants were staying in and eventually to the Expo centre itself! The Riviera hotel is a luxurious hotel in the centre of Taipei, located close to the expo centre. All the contestants stay at the hotel so it is like a big sleepover and no expense is spared on the experience. Upon walking into your room you are greeted by a G&G care package which includes tonnes of G&G branded swag such as a personalised hat, a towel, a small hard case and other bits and bobs which is a really nice touch! Luckily I got to the Expo centre with time to spare and had the chance to catch up with the team from G&G and the international media that were in attendance over a lunchbox of traditional Taiwanese cuisine. 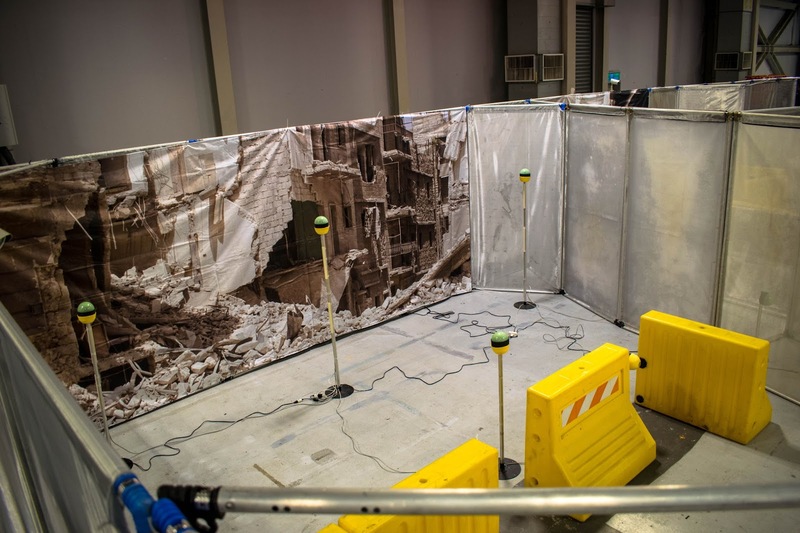 The Expo centre had been decked out for the event with no expense spared – it had a huge branded stage, G&G branded gazebos for the operations, medical and maintenance teams (the contestants are very well taken care of by the team) and all of the competitors. The competitor tents were decorated with bunting and flags of the teams countries which gave the whole event a very patriotic feel! The official start of the competition was signalled by lights and music coming from the main stage, quickly followed by dancers in inflatable costumes performing a lively little number before the G&G CEO himself, Mr James Liao took his place on stage to welcome the competitors. The very first day of the competition is a chance for the teams to meet and get to know the G&G team, the rival teams, set up their weapons/get to grips with them, to test them out on the M.E.T and to ensure there are no gun issues prior to the competition started. 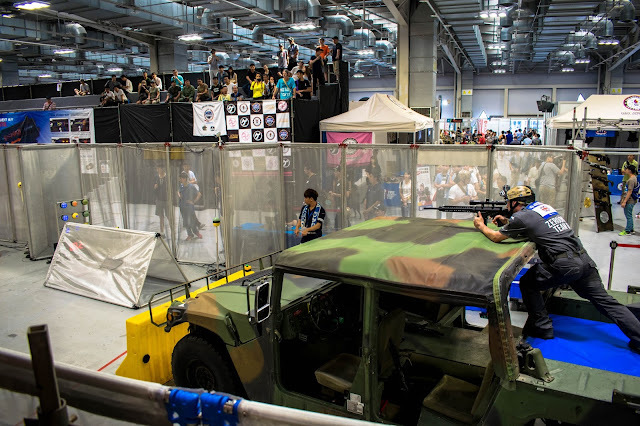 For the competition, each team gets 2 CM16-SRS rifles, a GPM-92 pistol and a G960SV sniper rifle – all of which are straight out of the box. No expense is spared during the competition. 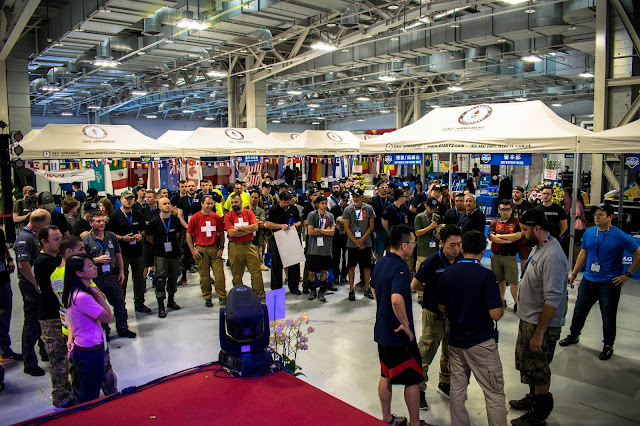 I spent Friday mingling with the teams and the international media, including the awesome guys from GSP, The House Gamers and Airsoftology. The second day of the competition is where the competitors qualified for their ranking the next day – those who came higher up in the rankings would go later in the day. Each team gets two attempts to run through each stage and their best time is used as their ranking for the finals. The day started at 9am with all contestants ready to get their rankings and the day went off without a hitch and all the teams were on great form which can be seen in their scores. The second day was also when G&G held the ‘Contestants Banquet’, after the day was over all the contestants made their way to their designated mini buses (dubbed the party buses) and we were on our way to The Grand Hotel in Taipei – one of the most famous hotels in the city. The hotel is absolutely gorgeous, as you walk up the marble steps it gives way to a luscious scarlet red carpet that spans the entire length of the foyer of the hotel. It is decorated in with lanterns and ornate patterns and dripping in the traditional oriental colours of red and gold. As we made our way through the hotel into the banquet hall itself, there were banners and flags lining the walls. The banquet was a great evening with lots of traditional Taiwanese cuisine and the contestants are treated to Taiwanese beer and rice wine. The banquet is a super enjoyable event with a lot of laughter and camaraderie all round. After the evening is over, everyone was transported to the Riviera Hotel to carry on an evening of camaraderie and drinks. As I was only there for 4 days, my nights were spent exploring the city of Taipei – after all, how often do you get to fly to the opposite side of the world? During the evenings we explored downtown Taipei, from the Shiling night market which was alive with colour, people and the smell of street food, to the quiet little artisan beer bars in the expo centre, to the famous beef rice bowl restaurant a short ride into the city on the MRT. Taiwan is a stunning country full of life, colour and scents that really make you feel alive. My only complaint, is the heat (typical Brit!) most days the temperature was hitting 35-40 degrees and it is really humid so shorts are an absolute must! The third and final day of the competition is where the teams would secure their final scores that would decide their fate in the competition. The day started at 8.30am and all the contestants were at their stations ready to take on the day – first up was the M.E.T 5x5 final, followed shortly by the Humvee Sniper and Search & Destroy final and finishing up with the CQB finals. 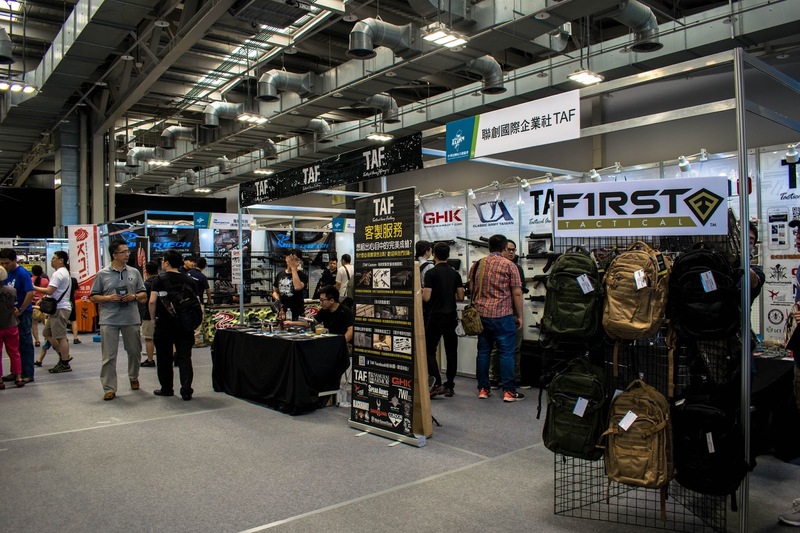 The day went well and the competition was intense, with crowds of people coming to watch the CQB finals from the stands, the whole expo was alive with activity and cameras flashing recording the event. It is to my understanding that there were a few gun fails during the last day but these were quickly resolved by the G&G Maintenance team. The Finale was a spectacular event and definitely the highlight of the competition. After the competition was complete and the scores had been counted, all of the contestants lined up with their respective countries sign and flag awaiting the results of the competition. Music began to play and Mr Liao started to present the winning teams with their awards and of course the coveted prize funds. 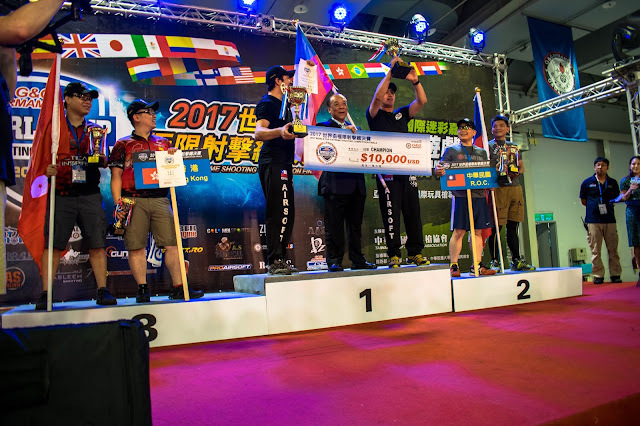 The overall winners of the 2017 competition were Chile Team B coming in 1st winning a very handsome $10,000 USD, Taiwan coming in 2nd and taking home prize money of $5,000 USD and Hong Kong coming in 3rd taking home a fab $2,000 USD. There are also monetary prizes for the winners of the individual stages. Germany took the prize for Stage 1 – M.E.T 5x5, Hong Kong took the prize for Stage 2 – Humvee Sniper, Chile team A were crowned the champions for Stage 3 – Search & Destroy and Chile team B took first for Stage 4 – CQB. At the end of the ceremony we faced to turn the ranking flags with the Chile national anthem being played as their flag rose to the top of the pack, the most poignant memory I have of this moment was the Chile team – hands over their hearts, pride in their eyes and singing their hearts out to their anthem. It was an amazing sight to see and a very well deserved win by the Chile team. 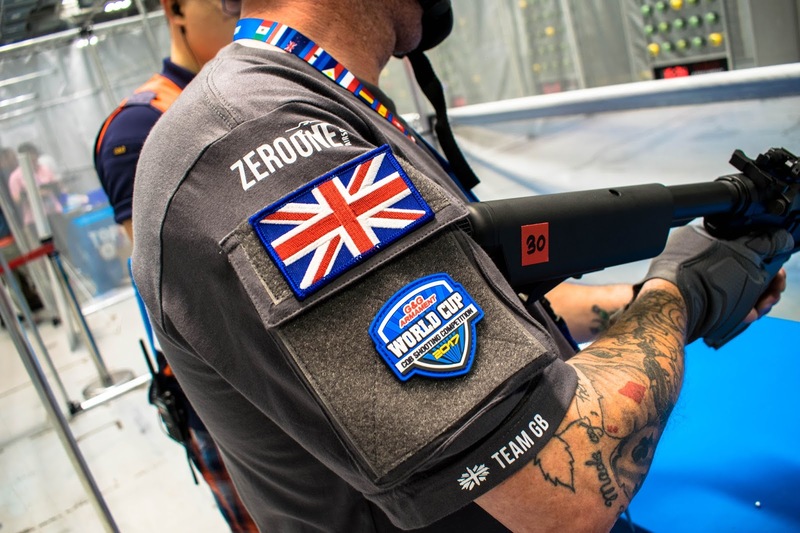 The UK team is sponsored by none other than Zero One Airsoft – the shop/site where the UK M.E.T 5x5 system is based. Our UK team is chosen from 2500 people who attend the National Airsoft Festival at Ground Zero in Ringwood on the bank holiday weekend in August. Players over the weekend compete in teams of two to eliminate the 5x5 in the quickest time possible – which is no easy feat with so many competing for the chance to go to Taiwan. Ian Cobbledick and Gavin Andrewartha from Cornwall qualified for the 2017 G&G World Shooting Cup during the 2016 NAF with the fastest time over the weekend. During the competition they ranked an impressive 13th in the qualifiers and 24th overall. Their plans moving forward are to train on their very own M.E.T system and defend their title of national champions at the Nation Airsoft Festival 2017. The guys were great competitors, fun to chat to and did their best in the stages. 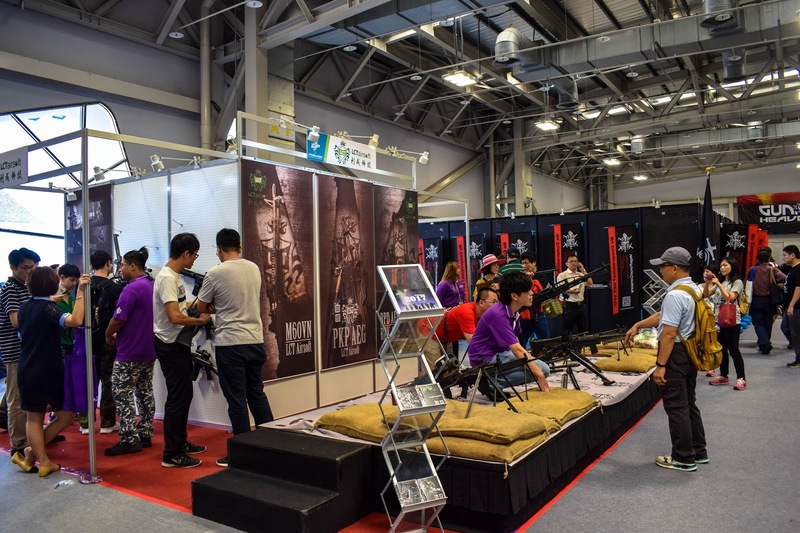 The G&G World Cup CQB Shooting Competition is held at the same time as the Taiwan Camo Festival where stores and manufacturers come together to put on an expo like event where players can come to try out new guns, run stages and compete in mini competitions for prizes and of course purchase new shiny camo and Airsoft goodies. 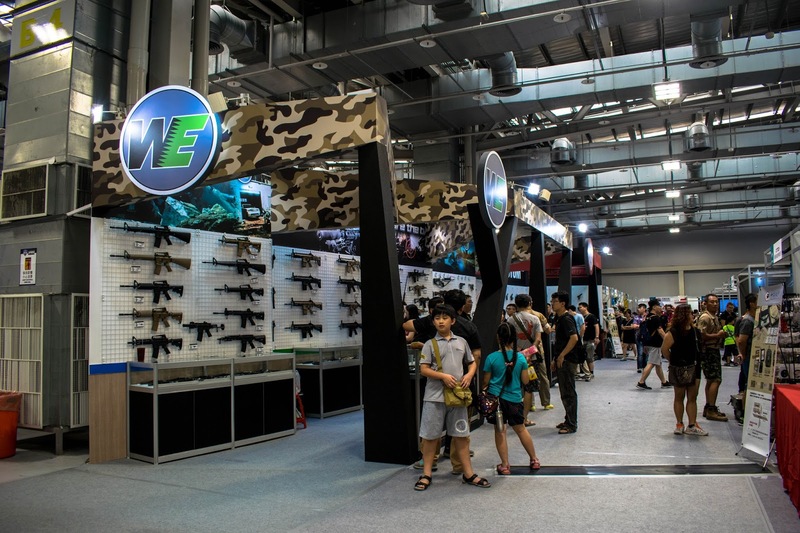 Companies in attendance included WE Airsoft, Modify, ICS Airsoft, VFC and Armourer Works. The Camo festival brings hundreds of visitors every year to view new products etc. 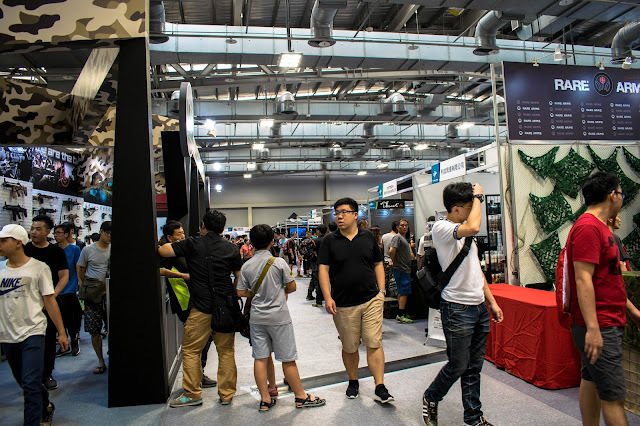 It was fun to walk around taking in the sight of all the different camos and to try out the marksmanship challenges that were dotted around the exhibition. There was a lot of kit there that I REALLY fancied bringing home but my case was already filled with swag thanks to the team at G&G so nothing more would fit in my suitcase! Overall, the event was a spectacular show of skill and determination from the contestants. It was an enjoyable event filled with camaraderie and sportsmanship and really epitomised the best aspects of the Airsoft community – friendly competition, honest play and sportsmanship. The trip itself is the trip of a lifetime. The competitors did great in the competition and many international friendships were forged. It was great to meet so many people from different cultures and learn about their customs, languages and Airsoft communities. 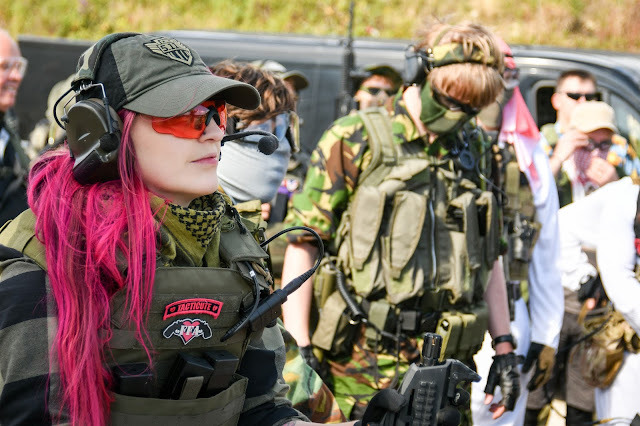 One thing that is clear to see is just how much time, passion and funds G&G invest in this event - I am so grateful to Airsoft Action for allowing me to represent them at the 2017 World Cup CQB Shooting Competition and to G&G Armament for flying me out, being such fantastic hosts and giving me the experience of a lifetime. Hardwick, K. (2017). G&G World Cup CQB Competition 2017. Airsoft Action. 78 (September), 20-23.